Whether you have had the pleasure of exploring the High Sierra or hope to one day, Tahoe Country offers cybervoyagers an inside view of Northern California and Nevada's favorite vacation spot. Locals and frequent visitors share the spirit of Tahoe and its surrounding areas through writings, photos, and artwork. Enjoy your amble through Tahoe Country discovering the unique flora & fauna, rich culture and history, and endless outdoor activities. And don't leave without checking out the Tahoe Country Store, a virtual gathering of High Sierra businesses and services. About Tahoe Country - Contributors, navigating information, and sponsors. Arts & Crafts - A gallery of artwork on the theme of Tahoe. Calendar - Various "happenings" around the High Sierra. Flora & Fauna - Read of wildlife encounters, identify flora and fauna. Home & Garden - High Sierra gardening tips, home projects, and more. Old Time Tahoe - A clearinghouse for information related to the Tahoe Basin's history. Out n' About - Places to visit and outdoor activities for all. Reader's Corner - Tahoe writers and books on Tahoe. Related Links - More web sites to visit. Tahoe Country Store - A virtual gathering place for High Sierra businesses and services. 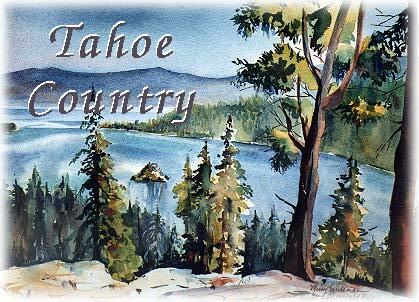 Visitors Corner - A place to request information and share tales of Tahoe. Webmaster - Email link to the webmaster. West Shore - Discover the "Magical West Shore", from Tahoe City's Fanny Bridge to Emerald Bay.